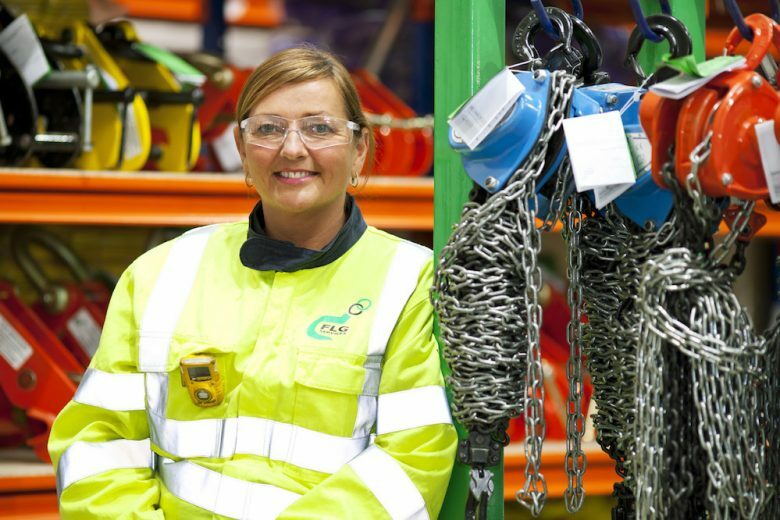 Jo Stamp is Grimsby Service Centre Manager at FLG Services, the UK’s largest dedicated lifting and safety provider. She shared her experience of working in the heavy lifting industry over the past 29 years. How long have you worked in the lifting industry? Since 1989, so almost 30 years. I began as a Hire Controller at the age of 19 and took on my first management role 10 years later. I spend a lot of time in my overalls visiting petro chemical and construction sites. You’ll find mehelping customers determine which equipment is suitable for their applications or getting stuck in dealing with any challenges that occur. When I’m not on site, I juggle my time between pricing up lifting enquiries, purchasing equipment, hire, sales, inspections and new installation work, plus dealing with and managing any issues which may arise at the service centre. As a specialist division of A-Plant we have the added bonus of being able to offer customers a one-stop solution, so, my role can also involve liaising with other teams including specialist plant, access and accommodation. Why did you decide to pursue a career in lifting/engineering and what has kept you there? When I was 19, I came across an advert for a position with a lifting firm in Grimsby and it was there that I developed the heavy lifting bug. I love lifting and can’t imagine my life without it. From hectic shutdown demands, which require late nights and weekend work, to assessing equipment on fairgrounds, or attending construction and engineering workshops, I enjoy it all. I believe it is this passion that has kept me in the industry and given me the drive to get me to where I am today. Tell us about your engineering qualifications. How did you acquire your knowledge? I trained and have gained certificates with The Lifting Equipment Engineers Association and I also attend regular training days with manufacturers to improve my knowledge. Has working in a typically male dominated industry provided any obstacles? Although it was rare to see a woman working in the industry in the 1980’s, I can honestly say this didn’t present any obstacles for me. With a name like Jo, I could tell when I went to see a new customer they sometimes thought they were getting a male turning up to site, as they had confused my name with ‘Joe.’ However, my professionalism and confidence would reassure them that I was more than qualified for the job. In the early days, I spent most of my time in the workshop, learning about the equipment and its capabilities. I worked with great lifting engineers who would show me how to strip down and put back together pieces of lifting equipment. I never felt I was being treated differently because I was female and they always made me feel part of the team. Have you witnessed any changes over the past 29 years? I have noticed a steady increase of women entering the industry over the past 30 years which is good to see. There is also a greater focus on health and safety which has made construction sites safer places to work. Have you achieved anything during your career that you are particularly proud of? I have been a member of construction charity, The Lighthouse Club, for almost 20 years. The charity provide financial and emotional support to the construction community and their families who have suffered an injury, long term illness or simply need a helping hand. This is a cause that is very close to my heart and today I am the secretary for its Lincolnshire division. How did you manage to get to where you are today and do you have any advice for people considering lifting as a career? When it comes to giving advice, I always tell people that honesty is the best policy. Deliver what you have promised and keep your customers in the loop at all times, even if it’s bad news. Never be afraid to ask questions. I have had many patient and supportive mentors within the industry, from the lifting engineers on the floor to directors within the business. I have spent years asking endless questions and this has helped me to understand the world of lifting and propel me to where I am today. Lastly, remember that passion is paramount. If you’re not passionate about what you do, you will not achieve your goals.